Afro Ventures: www.afroventures.com Offer a range of Namibia highlight tours in 4WD, the highlight being their 7 day desert, coast and dunes tours. Campfire Safaris: Run tours across Namibia at the more budget end of the price spectrum. Chameleon Safaris: www.chameleonsafaris.com Aimed at backpackers, Chameleon offer country-wide safaris at great value prices. Crazy Kudu Safaris: www.crazykudu.com Fun, friendly and good value safaris from this budget operator. Felix Unite: www.felixunite.com A water-based safari company with a selection of river-rafting, canoeing and kayak safaris to choose from. Kaokohimba Safaris: www.kaoko-namibia.com Specializing in the Damaraland and Kaokoveld regions of Namibia, these guys run cultural as well as wildlife safaris. Namib Sky: www.namibsky.com This is the company to use for balloon safaris over the Namib Desert. Okakambe Trails: www.okakambe.iway.na The horse safari specialist, from half day tours to a good selection of longer trips. West Coast Safaris: www.westcoast.demon.nl Camping safaris through the most isolated parks in Namibia. Wild Dog Safaris: www.wilddog-safaris.com Their safaris cover the whole of Namibia with a choice of camping or budget accommodation. Xama Adventures: Specializing in small to medium size group safaris for local and international clients with packages including great Orange River Rafting trips. Have a recommendation for a good safari tour operator in Namibia? Let us know. 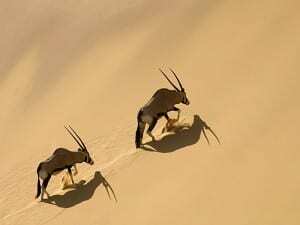 View safari companies in other Africa countries or read our reviews of Namibian national parks.